First Impressions: Odyssey took some getting used to in order to plow through it! My only other introduction to the author Jack McDevitt is through his excellent novel, "Time Travelers Never Die" so I was hoping this book was going to be a continuation of the excellent style I was used to. 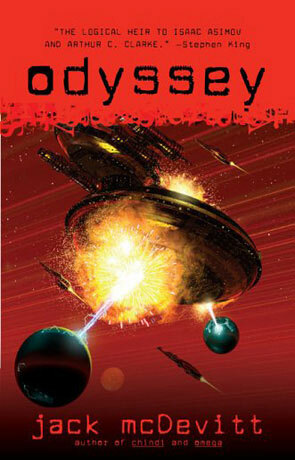 "Not so" say a few other reviewers, who pointed out to this writer that McDevitt has a series and Odyssey is the culmination of such a series starring Hutch, a former space pilot now administrator of the Academy, a space-faring service for scientists and such, and MacKenzie, a snarky, cynical journalist whose 23rd century profession has not changed much in the last couple of centuries. Odyssey moves slow, and takes its time in commenting on that 23rd century life, implying criticism of today naturally. It's just too obvious and too much! For example there is a thread through the story of a mousy man named Beemer who attacked a priest for preaching hellfire which frightened him and "ruined his life" when he was told there was no redemption for this 12 year old now man. MacKenzie was backing up Beemer hoping for some kind of conviction. The end chapters give headlines and blurbs of the ongoing trial. Very minor part of the story and a bit of a waste of time for this reader. After a few hundred pages of administrative angst by Hutch, and her politically motivated boss, there are rumors that the Academy may be shutting down since it has been found that there is little to no life in the immediate vicinity of the Milky Way and that we are wasting our time on the space effort and that we should concentrate on the failing Earth's ecology – greenhouse has really come a long way in two centuries, apparently. Finally some political intrigue, the death of a favored character and still the unexplained and incomplete ending of the first and only contact with alien life left me a bit "so what." There is also the senator's young daughter Amy who is contacted by these aliens but it comes in the form of a late-night visit. Was this a hoax? Should we pay attention to their threat of destroying an atomic collider that could give us the answers to the Big Bang, or should we worry about reputation and not tell anyone of the true dangers of this collider? Bottom Line: Great potential, but the story could have been shortened a couple hundred pages as an interesting short story than a novel. Still, I have not given up on Jack McDevitt. Let me look up his Hugo winners and see if I can see some of his early work. The present Odyssey, though supposedly in alignment with Homer's similarly-titled tale, drags for me and is more a political criticism in the guise of science fiction than a novel that would rival Heinlein or Asimov. No danger there! Written on 17th February 2012 by Jim.